Earwax is a waxy substance in the ear meant to protect and clean the ear canal. Figuring out what earwax is is the first step to treating it. Earwax grows slowly, pushing dirt and other particles from the ear. It usually falls out on its own. Sometimes, however the earwax can build up and cause heavy feelings in the ear canal or hearing issues. Earwax is an itchy substance, but it does have a purpose. Not only does it clean the ear, it provides lubrication. Often times, when people think they have excess earwax when in reality they have the typical amount. Sometimes, however, earwax does build up, and that requires medicinal attention. The trick is figuring out whether or not the ear wax is excessive. 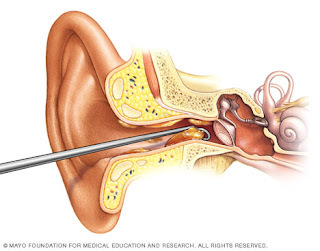 If one is experiencing hearing loss or pain, this could be a sign of excess ear wax. Anything from a slight muffled sound to almost complete deafness can be a sign of hearing loss created by ear wax. If left untreated, it could cause permanent damage to the ear drum. Feeling pain inside the ear drum can also be a sign of excess ear wax. Check the symptoms and consult a doctor if needed. At home removal can help alleviate minor pain or discomfort, but it’s important to do it safely. Never ever use a cotton swab. As stated before, the ear wax is slowly emerging itself from the ear canal. Although a cotton swab will remove some of the ear wax, it will push the majority of the wax back down in the canal. This can cause damage to the ear drum. Products for removing ear wax can be bought at the store, but it can also be done with household products. All one really needed is a dropper, some sort of oil such as baby oil, mineral oil or olive oil, and water. The oil should be warmed (but not hot). Fill the dropper (these can be purchased at a drug store) with some of the warm oil, and tilt the head to the side. Place several drops of the warm oil in the ear, and allow it to rest in there for several seconds. The heat will “melt” the wax. Tilt the head the other way, and catch the oil in a tissue of cloth. There should be some wax deposits on the tissue as well. If there are none, repeat the process. Afterwards, clean the ear out with water and dry completely. Usually at home treatment works, but if the hearing loss and pain persist, medical treatment is advisable.